Alexios Trantas, in 1907, first used the term“gonioscopy”, from the Greek origins on gonia meaning “angle” and skopein to “observe”. Maximilian Salzmann was the first to use a contact lens and indirect gonioscopy for examination of the angle. Therefore, both Trantas and Salzmann are regarded as the “fathers of gonioscopy”. When light passes from a medium with greater index of refraction to a medium with lower index of refraction, the angle of refraction (r) is greater than the angle of incidence (i). The angle of incidence (i) reaches critical angle when r is equal to 900. The critical angle for the cornea-air interface is approximately 400. Light rays coming from the angle of the anterior chamber exceed the critical angle and are therefore reflected back into the AC (anterior chamber). This prevents visualization of the AC angle. This deficiency can be overcome by optically replacing the cornea with another interface. The refractive index of the contact lens is the same as that of the corneal epithelium so that there is minimal refraction at the interface of these 2 surfaces (Contact lens-cornea). This removes the optical effect of cornea. The light rays from the AC angle reach the contact lens. Subsequently, they are made to pass through the new "contact lens-air" interface. In direct gonioscopy (gonio-lens) the anterior curve of the contact lens is such that the critical angle is not reached. 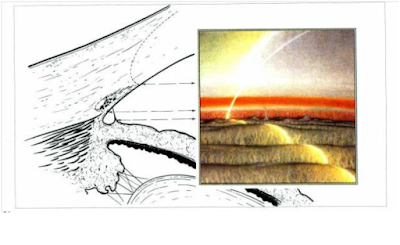 The light rays are refracted at the contact lens-air interface to the observer’s eye. 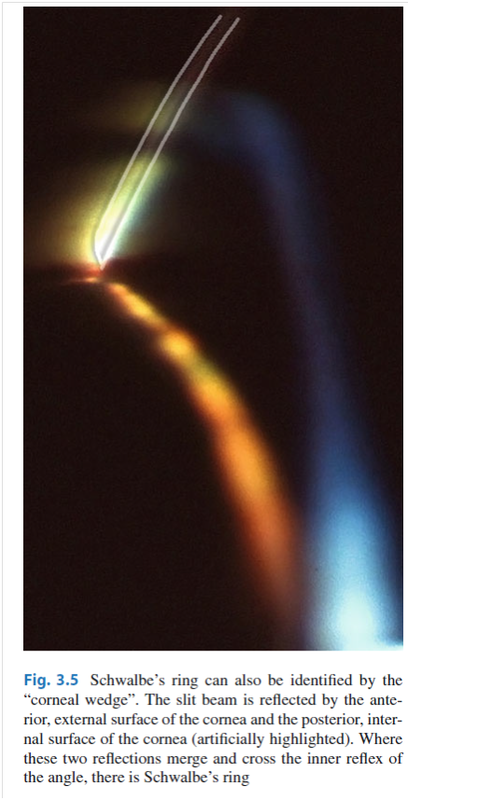 In indirect gonioscopy, the light rays are reflected by a mirror in the contact lens (gonio-prism). The light rays leave the lens at nearly a right angle to the contact lens-air interface. Shorten slit beam as much as possible. Do not throw light into the pupil. Keep beam off-centre at 30-350. Place lens gently on the eye with patient looking up. Once the lens is in place ask patient to look straight. Now move the beam towards the periphery. In myopes, aphakia/pseudophakia you can see the ciliary body. It appears as a pink, dull brown or slate grey band. The scleral spur is the posterior lip of the scleral sulcus. It appears as a prominent white line between the dark ciliary body band and the pigmented trabecular meshwork. 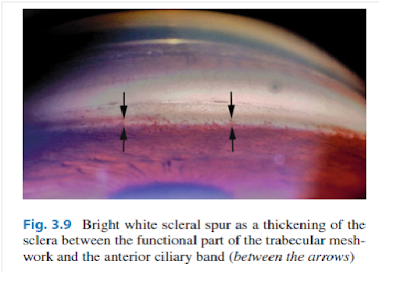 Fine, pigmented strands frequently cross the scleral spur. They run from the iris root to the pigmented trabecular meshwork and are called “iris processes”. 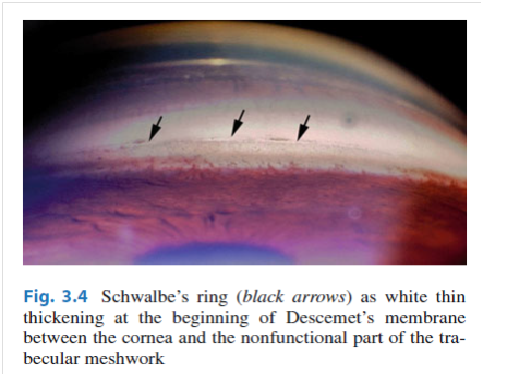 (They represent thickenings of the posterior uveal meshwork).They might be confused with peripheral anterior synechiae and need dynamic gonioscopy for confirmation. 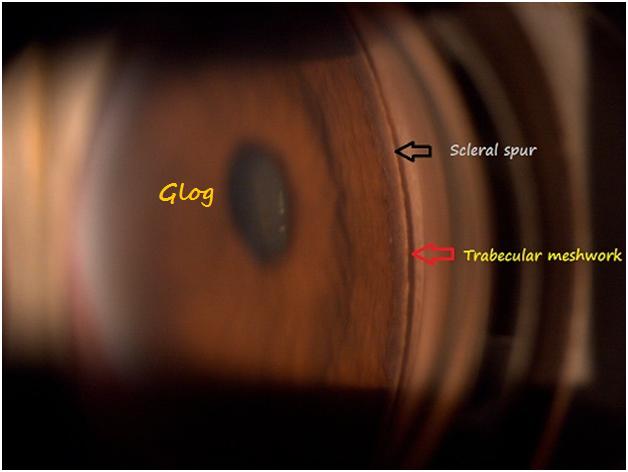 Anterior to the scleral spur is the functional trabecular meshwork. It is seen as a pigmented band just anterior to the scleral spur. The junction of the angle structures and cornea is called Schwalbe’s line. It is the peripheral termination of Descemet’s membrane. It appears as a fine ridge or opaque line. In highly pigmented eyes, it can be pigmented, especially inferiorly. Seen in myopia, aphakia, pseudophakia. 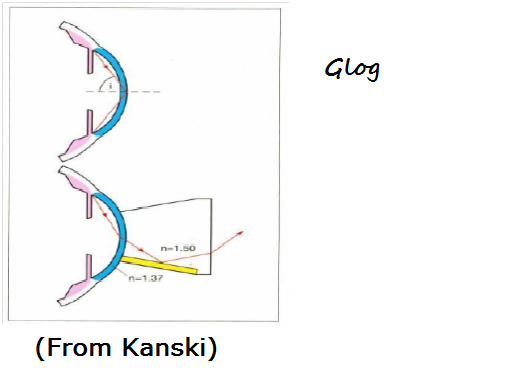 Angle closure possible but unlikely. Angle closure not inevitable, but risk is high. 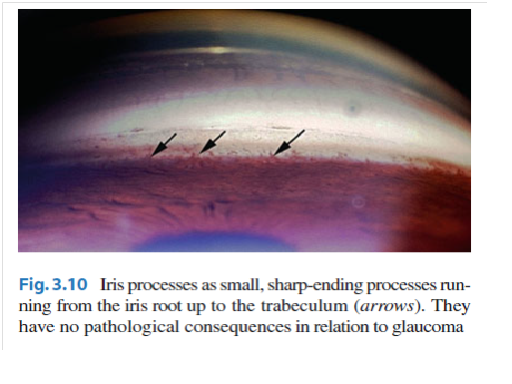 No obvious irido-corneal contact. However, no angle structures can be identified. High risk of imminent closure. Iridocorneal contact present. Inability to identify the apex of corneal wedge. Indentation gonioscopy is required to differentiate appositional from synechial angle closure. Pressure is applied on the cornea with contact lens, this pushes aqueous into the AC angle. This opens up the angle. 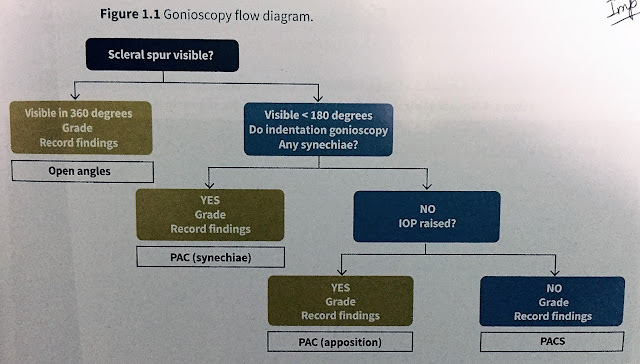 In case of peripheral anterior synechiae (synechial closure) the angle may not open but will open up if only iris processes are present or the cornea and angle structures are in close approximation (appositional closure). 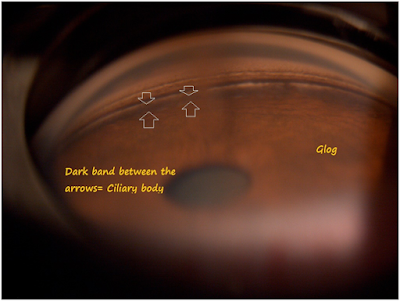 Some of the pictures have been taken from: Gonioscopy by Christoph Faschinger & Anton Hommer. Springer publications.